Have Someone in Your Family that's Hard to Love. Try this. But there’s likely at least one thing – that if you look hard enough – that you kind of like, admire or even respect about that person. 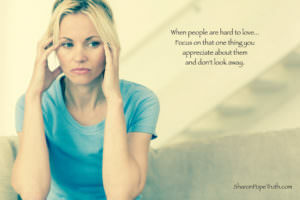 They may have ten different traits that frustrate you and drive you away. But I’ll bet they have at least one thing about them that endears them to you (even if it’s just a little). My father and I haven’t always had a great relationship; for a lot of years, we struggled. I might look a lot like my father, but that’s where the similarities seem to end. We don’t share many of the same views on politics, we don’t have the same religious beliefs and we just see the world through very different eyes. But somewhere along the way we stopped trying to change each other and just decided to love each other. I get to witness the adoring way he loves my mother. So that’s where I choose to focus. They say, what you focus on expands….. I focus on the way my Dad loves my Mom because it actively demonstrates his heart. I focus on the way my Dad puts my Mom before everything and everyone because it reminds me of the kind of selfless and loving man he is (and always has been, even when I couldn’t always see it). I focus on the way my Dad looks for new ways to care for my Mother because it feels good for me to focus on that part of him. And the more I focus there, the less room there is for all the other stuff in my mind, my perspective and my experience of him. There’s no room left for the differences. So, this holiday, when you are spending time with that special someone in your family that has been hard for you to love historically, find that one thing in him or her and focus there. Don’t look at anything else about them and don’t look away. Let it expand so much so that there’s no room for any of the other differences or criticisms or opinions that previously robbed you of the opportunity to really see that one special part of that one special person.